Howard Schultz won’t last long as a presidential candidate. It’s clear to most that he’s not ready for the fight ahead of him. Schultz’ demise started early. A day after the former Starbucks chief Howard Schultz said he might run independently for US president, in fact. But it gets worse for Schultz as he now distances himself from Democrats in his latest act. And in doing so, Schultz goes after the newest Democrat sacred cow. Yes, Schultz admitted that Alexandria Ocasio-Cortez tilted the Democrats far left, and he wants no part of it. But in truth, Schultz took notice of Democrats long before he trashed Ocasio-Cortez. Former Starbuck CEO Howard Schultz is walking back his criticisms of Democrats somewhat by axing a column from his Twitter account that contained insulting language towards his possible rivals for the 2020 race. Ever since he kicked off his media tour to promote his potential third-party presidential run, Schultz has been documenting the public reactions by posting columns and articles about his chances on his Twitter timeline. 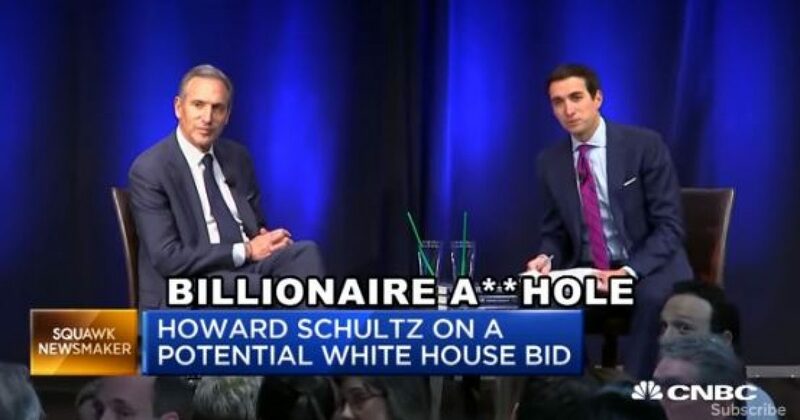 One of them was a PJ Media piece called “Howard Schultz Could Actually Win the Presidency,” and as the headline suggests, it says Schultz could be much more than a spoiler for Democrats in the 2020 race. The article advances Schultz’s argument that he could win the presidency if he makes a successful appeal to those who don’t care for President Trump or for the hard-left candidates crowding the 2020 field. However, it also contains some disparaging comments about Senators Kamala Harris (D-CA) and Elizabeth Warren (D-MA), both of whom Schultz has critiqued in recent days. Current frontrunner Kamala Harris is far from reassuring. She’s a shrill (see the Kavanaugh hearings) quasi-socialist promising pie in the sky — Medicare-for-all, debt-free college, guaranteed pre-K, minimum basic income, confiscatory taxes — and she’s just getting started. Bernie and others will soon be following suit. Fauxcahontas already has, competing in a game of socialist one-upmanship. What will the #MeToo movement do with Schultz? He attacked a Latina, a black woman, and a fake Indian woman, for goodness sake. In truth, Schultz could have plugged any Democrat, male or female, into his comment and still fit. But like most Leftists, he’s scrubbing his past. Schultz hasn’t acknowledged the insulting language, but the article is no longer anywhere to be found on his timeline. So far, Schultz is shrugging off concerns from Democrats who say that he’ll only help Trump’s re-election if he gets involved in the 2020 race and siphons votes away from the president’s opponent. As for Trump, he might be goading Schultz into getting involved by saying he “doesn’t have the guts” to do it. President Trump is right in that it takes guts to be president. Especially when you go around the system, i.e. those who believe they paid their dues and waited patiently in line. Schultz hasn’t seen anything yet, when it comes to what the Democratic Party will do to him.